All stages of babyhood have their own special brand of magic. The first stage is the true newborn from birth to about 14 days. At this stage, the baby is fragile yet miraculous and still retains its womb-like behaviour of curling tightly and sleeping anywhere. From 14 days to 12 weeks, your baby still has the distinctive newborn look but is gradually becoming more alert and aware of the world, building a connection with you through smiles, eye contact and physical bonding. In this phase, your newborn is often awake for a lot of the photo shoot although we can also capture some gorgeous sleeping shots as well. But of course if bubs is older than this age bracket I'm still more than happy to photograph their beauty just knowing that they will not be in the same poses as a newborn for safetey reasons. Newborns have the gift of sleeping with intense concentration regardless of their surroundings, so we can pose them in a range of natural positions – snuggled within a textured wrap, on big brother’s lap, over your arm or across your chest. Throughout the shoot, we will capture those fleeting dream-like smiles, contentment, yawns and chuckles. The newborn photography session usually goes for about 2 to 3 hours. There is no time limit to the photo session, allowing your newborn to set the pace, so you and your baby both stay relaxed and have fun together. There is plenty of time to take a break whenever your newborn wants a feed or needs to be settled. The best time to capture your baby as a “true” newborn is usually between 5 and 10 days, so I recommend you book your newborn photo session during your pregnancy, basing the appointment on your due date, and then call me soon after your baby is born to confirm the time. Of course your baby won’t have much consideration for appointments, so if you give birth early or late, I will give you priority for an alternate time. 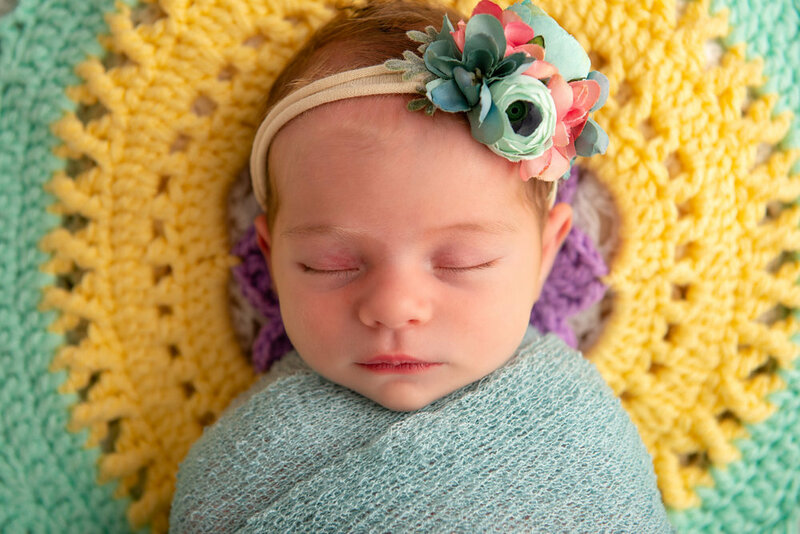 If you prefer the newborn portraits to be taken while the baby is between 2 weeks and 12 weeks old, we still recommend making the appointment during pregnancy. We recommend wearing simple clothes in plain colours. Avoid clothes that have bold patterns or logos as these can detract from the images. Bring a change of clothes and some spare nappies – we also recommend you bring a change of clothes for yourself as surprise accidents can happen if you are holding your newborn during the nappy-free part of the photo shoot. You do not need to bring much to your newborn session. I do suggest a change of clothes for you and other family members, as sometimes accidents do happen with bubs. Also a change of clothes for bubs for after the session to go home in. If you are not breast feeding I do ask you do bring some extra milk as bubs will need a top up and most likely an extra feed during the session. Just your general nappy bags needs also.Please also bring along a dummy, even if your bub doesn’t seem to like them, as they can assist with the settling process. I love to have other sibling along in Newborn sessions. I generally don't try and get a sibling in straight away, I like to try and let them warm up to me and have a little bit of a play and get comfortable of being in a new environment. If your child is unhappy or not ready for the photos I do not want you to force them into it, they will generally come around by the end of the session especially when mum and dad get involved also. All of the sessions here at KLD Photography require a $100 session fee. This is due upon booking in your session. Your session fee covers my time, experience and talent as your professional photographer and graphic designer to custom precess the finest captures from your session with 1 11x14 print included in your fee. KLD Photography's Portrait packages then start from $420 and include an abundance of amazing products. The most important thing is that this is a really happy time for you all – enjoy yourself and relax! Most of the time, I will position bub and move them around as I photograph. If at any stage they awaken and become unhappy, I will ask mum to settle and feed bub. At times, it will take some minutes to get bub comfortable in a certain pose or position, and this is completely normal. Don’t worry about any little accidents that might occur during the shoot – I’m used to it and everything will be cleaned afterwards. Please feel free to check out my Newborn Gallery to see more beautiful mummies to be!